Fill Lunchboxes and Easter Baskets with Go Organically Fruit Snacks! If your looking to fill your child's Easter basket with tasty treats that aren't filled with artificial colors, artificial flavors and high fructose corn syrup and other icky ingredients, then let me recommend you fill them with Go Organically Fruit Snacks! They are the same texture and taste of other fruit snacks that children LOVE but without all the icky, harmful ingredients! 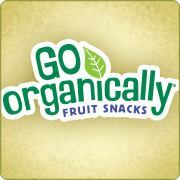 Go Organically® Fruit Snacks are USDA-certified organic, made with real fruit purées and real fruit juices. These tasty smart and delicious treats include 100% of the daily recommended value of Vitamin C and are an excellent source of Vitamins A and E.
Go Organically® Fruit Snacks are GMO-free, gluten-free, preservative-free and made with natural flavors and colors from natural sources. Not to mention, each individual pack is only 70 calories! The come in three tasty varieties including Mixed Berry, Fruit Medley and Tropical! My children get excited every time they get Go Organically Fruit Snacks for a treat and I don't have to cringe about any of the ingredients going into their bodies! Children will love finding Go Organically Fruit Snacks in their Easter baskets or lunchboxes this spring! They are perfect as a snack - throw them in the diaper bag or your purse! They are definitely a new favorite in our house! You can purchase Go Organically Fruit Snacks at your local retailer.